Binary-and-Map Input provides a means for fast input of programs. 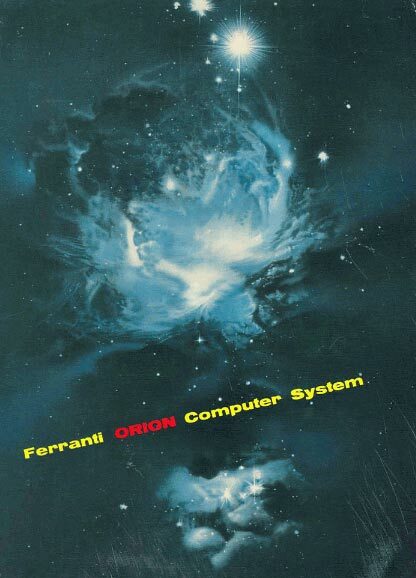 It is the nearest to binary input that is provided on Orion. It is at present available on magnetic tape, and 7-track paper tape. 7.3.1.1 The B-directive (see 7.1.4.2.16) gives the number of words in Binary-and-Map language that follow. On seven track paper tape the B-directive is followed by two newlines, after which the binary and map information begins (this includes a checksum); on magnetic tape the binary and map information begins in the next block after that containing the B-directive. Blocks on magnetic tape follow the conventions of section 6. When Binary-and-Map Input has completed its work, it returns to Basic Input to continue reading the tape. 7.3.2.1 Binary-and-Map language consists of any number of units consisting of one word of map followed by twelve words of program, and one unit consisting of one word of map and up to twelve words of program. On seven track paper tape this is followed by a checksum. 7.3.2.2 The map word in each unit specifies how each word of program in that unit is to be relativized, i.e. whether or not the datum point is to be added in to the X or Y fields. D25 1 if Y of 12th word of program is to be relativized. It is only possible to have addresses of rank 1 or 0 in binary-and-map language, and rank 1 addresses in the X-or Y-address positions of the word only. 7.3.2.3 The program words comprise the words that are to be stored, in binary, prior to adding in the datum point where necessary. Binary-and-Map Input begins storing words on the drum, starting at the current value of Basic Input’s V1, and when it has completed its work, leaves V1 and V2 increased by the number of words stored. 7.3.3 On seven track paper tape only, there is a checksum, which is formed by adding every word of the binary and map information (program and map words) to a location initially clear, and after each addition forming the not-equivalent with OVR. I.E., for each word INFO of the information. is obeyed. The number in the B-directive includes this checksum. 7.3.4 When Basic Input resumes control from Binary-and-Map Input, all settings of identifiers, forward references not yet filled in, monitor conditions, calls, etc., still apply. On 7-track paper tape Basic Input resumes reading with the next character on the tape; on magnetic tape with the first block after the last one containing binary-and-map information. 7.3.5 A library program called Mapper has been provided to convert programs from Basic Language to binary-and-map form.